The castle, as shown in the mode's preview. Peach's Castle is the first course in the Dribble Race mode Mario Hoops 3-on-3. This course is available from the start of the game and the default time to beat is 45 seconds. If the player is able to beat that time, along with the time to beat in Sunshine Road, Rainbow Road is unlocked. 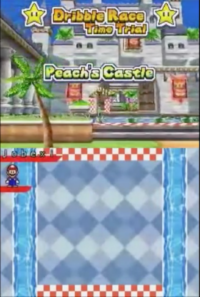 The course itself is set right in front of the door of Princess Peach's Castle. Two small trenches of water surround either side of the course. The player starts out at the starting line and faces three Warp Pipes, all which cast Green Shells one at a time in quick succession. Three ? Panels are on the course at all times, each holding a total of ten coins. The player must gather 100 coins from the ? Panels while dodging the incoming Green Shells. Once 100 coins has been reached, the player may end the game by running onto the finish line, which is located on the opposite side of the course and is where the three Warp Pipes reside.